Commissioner Gordon, also known as James Gordon, is a Batman minifigure that appeared in LEGO Batman: The Videogame. He first physically appeared in 2013, apart of the DC Comics Super Heroes theme. He will appear in 2017 in The LEGO Batman Movie theme. Gordon's physical variation is based off his appearance in The Dark Knight Rises. He has Mutt Williams' hairpiece. He has black, rectangular-rimmed glasses, and a large dark brown mustache and a second face with an scared expression. His torso is dark blue and mostly features a dark grey, bulletproof vest with the word SWAT on it. He has back printing similar to the front, but with more back pockets. His arms are also dark blue, his hands are flesh, and his legs are black. In LEGO Batman: The Videogame Commissioner Gordon has a grey male hairpiece, a head with glasses and a mustache. He wears a brown police coat and matching brown trousers. His appearance is similar in LEGO Batman 2: DC Super Heroes, except his legs are black, he has backprinting that looks similar to Lex Luthor's, and he has a more realistic police badge. James Gordon is the commissioner of the Gotham City Police Department and one of the few honest officers. He also was one of the only police officers to show Bruce Wayne compassion after his parents' murder, hence why Bruce respects and trusts Gordon so much. Early in Batman's career he formed an alliance with the hero and the district attorney Harvey Dent to take down organized crime in Gotham. However, during a trial Dent was scarred by Sal's "Boss" Maroni and half of his face was hideously scarred. Dent turned into a villain himself, taking the name Two-Face. Though Dent's transformation shook Gordon and Batman, they continued their alliance. Although Gordon doesn't approve of Batman's vigilante menthods, as he appreciates the results and protects him from other police officers, such as Harvey Bullock, who don't trust him. Gordon also has a daughter named Barbara (who, depending on the depiction, may be his adopted niece) who was inspired by her father's heroism to join the GCPD, but was turned down, which led to her career as Batgirl. Eight years after the events of The Dark Knight, Gordon has lied in order help cover up the fact that Harvey Dent had murdered five people, which Batman took the blame for. He has decided to resign as Commissioner, but decided against saying so. As Bane is rising and Batman returns, Gordon enters the sewers accidentally, gets hurt, and is brought to Bane. Bane takes the speech Gordon had prepared before Gordon jumped into the sewage pump. He sits in the hospital, operating through Batman and John Blake. Bane defeats Batman and isolates and takes complete control of Gotham. He reveals that Dent was responsible for the five murders and John Blake is disgusted with Gordon, though he still works with him. When Batman returns to Gotham from the pit, Gordon helps Batman overthrow Bane and Talia Al Ghul by placing a distorter on the nuclear bomb. Batman reveals his identity to Gordon, shortly before he seemingly sacrifices himself. Gordon stays as police Commissioner. 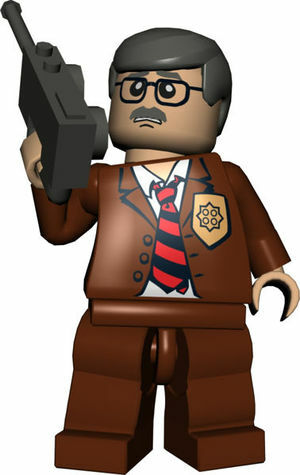 In LEGO Batman: The Videogame, Commissioner Gordon was armed with a pistol and appeared in all three stories and the prologue. He was a boss on the level A Surprise for the Commissioner and was unlocked for purchase afterwards. In the video game's prologue, Gordon appeared right at the end where he is seen pushing a red button on his desk which lights up the bat-signal. In the events of Riddler's Revenge, Commissioner Gordon caught The Riddler and Poison Ivy sneaking into a greenry. He ordered the Police Force to defend the building. During Power Crazed Penguin, Commissioner Gordon and the Police Force confronted Bane and The Penguin at the dock when they stole a satellite that was being delivered. Penguin escaped on his submarine with the satellite, but he abandoned Bane. Bane became angry and threw a police car into the air, which landed back on himself, knocking him out. He was towed to back to Arkham Asylum. Gordon was later attacked by a Penguin Minion in his office before the satellite was destroyed by Batman and Robin. In Joker's Return, Gordon was lured to an abandoned carnival by Harley Quinn and The Joker. He was later rescued by Batman and Robin, and Harley Quinn was taken prisoner. When The Joker and Killer Moth arrived to rescue Harley Quinn, Gordon was determined to defeat them and dispatched three mobile headquarters and many S.W.A.T. agents to do so. They were destroyed by the clown walker, but Gordon survived and called for help from Batman. Later, after The Joker and Harley Quinn were defeated, Gordon was there to arrest them and send them back to Arkham Asylum. Commissioner Gordon appears after Batman and Robin stop The Penguin, Catwoman, The Riddler, Bane, Poison Ivy, Two-Face, and Harley Quinn from escaping Arkham Asylum. He informs them that only The Joker seems to have escaped. He heard how it seemed as though Lex Luthor had rescued Joker, and suggested that Batman did something about it before the Presidential Election the next day. He was then informed of a break-in at Ace Chemicals by a Police Officer, and when he turned around, realized that many of the Asylum Inmates had escaped. On the portable versions, his minikit can be found in the level Assault the VTOL. He costs 20,000 studs. In The Dark Knight trilogy, Gordon is played by Gary Oldman, who also plays Sirius Black from Harry Potter. Additionally, he voiced Lord Vortech, the main antagonist of LEGO Dimensions. He uses the same torso as the Police Chief from World City in both video games and the movie, just in a different colour. This is a description taken from LEGO.com. Please do not modify it. Jim Gordon is the police commissioner of Gotham City. He has dedicated his life to locking up criminals and protecting the city’s citizens, and has proven himself a valuable friend and ally to Batman many times. This page was last edited on 4 February 2017, at 18:15.